Cabinet refinishing Denver co. 303-573-6666 Knows that Doing finishing work on your kitchen is a great way to liven up your living space, and increase the value of your home at the same time. 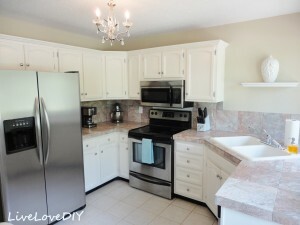 A long weekend and some planning can result in a remarkable kitchen make over, and can be done in a few weeks with organization and a positive attitude. We’ll give you a basic overview of refinishing kitchen cabinets, and a few clues on where to start. Cabinet refinish in Denver co. wants you to know that you always want to make sure when painting your kitchen cabinets a solid color to do caulking on the front of the insert of the door panels in order to get rid of that small crack line. When caulking you want to make sure to cut the tip of your tube of caulking with a razor knife very very small in order that you don’t get a huge accumulation of caulking. So if you’re looking for the right company to get the painting of your kitchen cabinets done right the first time give us a call here at cabinet refinishing DenverCo.